I just finished up the vest I started knitting in August! Modifications: I made the body an inch longer than the pattern gives. 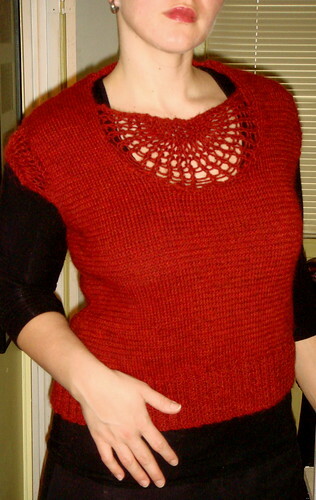 What I like: The spiderweb yoke and sleeve caps look great. The yarn is a pleasure to work with. What I don't like: Despite the extra length I added, the vest is still a little too short and too wide to be flattering on me. I'll try blocking it a second time for a better fit. Things to work on: I'm still no good at making even edges or seaming neatly. I also need to try harder to keep track of my row numbers when I'm knitting. How I'll be wearing it: I'll wear it over a 3/4 sleeved shirt with a skirt. ps - your blog always makes me smile. Cheers. Very inspiring. 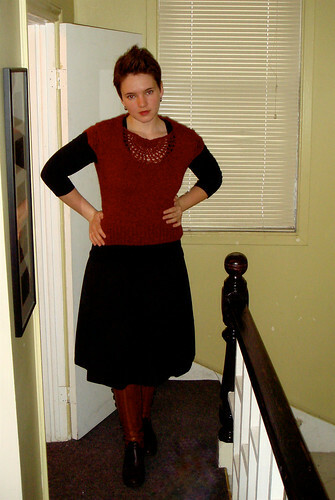 I am going to try and knit a me-sized jumper this year... but maybe a vest is a better place to start. I have the attention span of a gnat. Great neckline! And the color is flattering on you too. I have been terrible about my knitting projects. I've one sweater which I realized too late needs to be redone (well, just the front panels-it's a cardigan), and another requiring new front panels (do you see a trend?). In the meantime, I've been doing baby blankets, which fortunately don't require fitting.